In this document, you create a custom language model. You can then use this custom language model in conjunction with existing state-of-the-art speech models from Microsoft to add voice interaction to your application. If you don't have a Cognitive Services account, create a free account before you begin. To ensure that your Cognitive Services account is connected to a subscription, open the Cognitive Services subscriptions page. 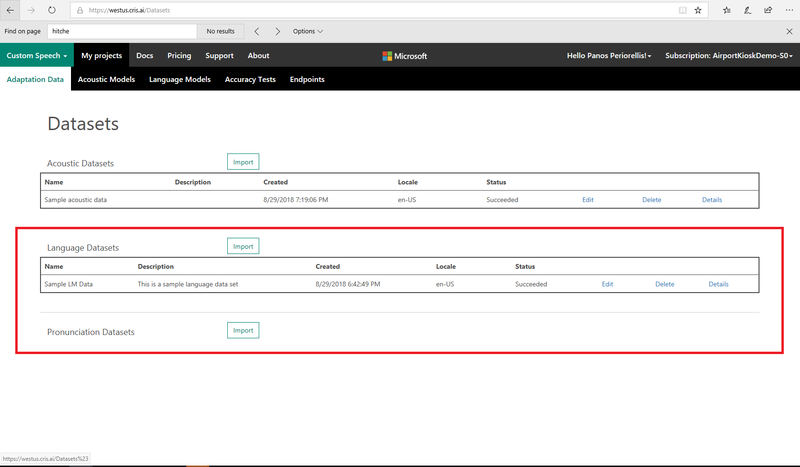 To connect to a Speech Services subscription that was created in the Azure portal, select the Connect existing subscription button. For information about creating a Speech Services subscription in the Azure portal, see the Get started page. "The patient has had urticaria for the past week." "The patient had a well-healed herniorrhaphy scar." The sentences do not need to be complete or grammatically correct, but they should accurately reflect the spoken input the system is expected to encounter in deployment. These examples should reflect both the style and content of the task that the users will perform with your application. The language model data should be written in UTF-8 BOM. The text file should contain one example (sentence, utterance, or query) per line. If you want certain terms to have a higher weight (importance), you can add several utterances to your data that include those terms. The main requirements for the language data are summarized in the following table. When the text is imported, it is text-normalized so it can be processed by the system. However, there are some important normalizations that must be done by the user prior to uploading the data. See the transcription guidelines to determine the appropriate language to use when preparing your language data. See the full list of supported languages for custom Speech to Text language models. Select the Import button in the Language Datasets row, and the site displays a page for uploading a new data set. When you're ready to import your language data set, sign into the Speech Services portal. First, select the Custom Speech drop-down menu on the top ribbon. Then select Adaptation Data. The first time you attempt to upload data to Speech Services, you'll see an empty table called Datasets. 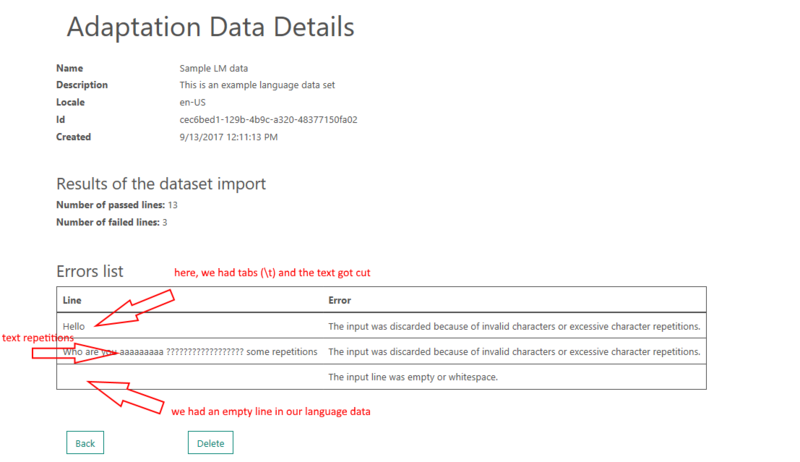 To import a new data set, select the Import button in the Language Datasets row. Then the site displays a page for uploading a new data set. Enter a Name and Description to help you identify the data set in the future, and then choose the locale. Next, use the Choose File button to locate the language data text file. After that, select Import, and the data set will be uploaded. Depending on the size of the data set, import might take several minutes. After the import is complete, the language data has an entry that corresponds to your language data set. Notice that it has been assigned a unique ID (GUID). The data also has a status that reflects its current state. Its status is Waiting while it's being queued for processing, Processing while it's going through validation, and Complete when the data is ready for use. Data validation performs a series of checks on the text in the file. It also does some text normalization of the data. When the status is Complete, you can select View Report to see the language data verification report. The number of utterances that passed and failed verification are shown, along with details about the failed utterances. In the following example, two examples failed verification because of incorrect characters. (In this data set, the first line had two tab characters, the second had several characters that aren't part of the ASCII printable character set, and the third line was blank). When the status of the language data set is Complete, it can be used to create a custom language model. 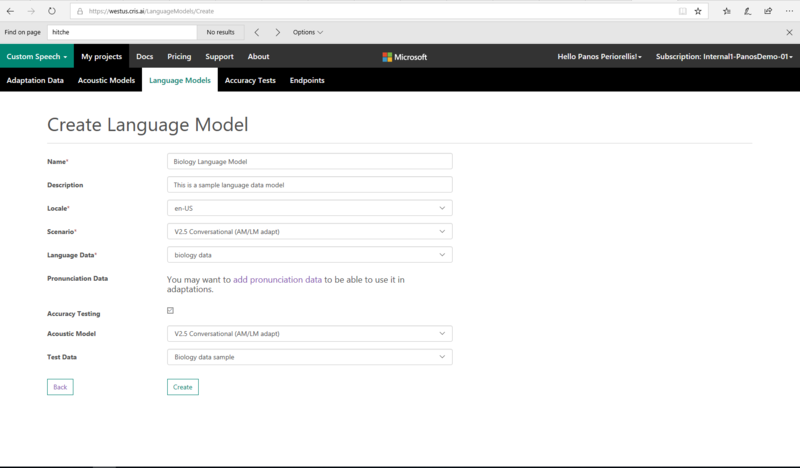 After your language data is ready, select Language Models from the Menu drop-down menu to start the process of custom language model creation. This page contains a table called Language Models with your current custom language models. If you haven't yet created any custom language models, the table will be empty. The current locale is shown in the table next to the relevant data entry. The appropriate locale must be selected before taking any action. The current locale is indicated in the table title on all data, model, and deployment pages. To change the locale, select the Change Locale button that's located under the table title. This takes you to a locale confirmation page. Select OK to return to the table. On the Create Language Model page, enter a Name and Description to help you keep track of pertinent information about this model, such as the data set that's used. Next, select the Base Language Model from the drop-down menu. This model is the starting point for your customization. There are two base language models to choose from. The Search and Dictation model is appropriate for speech that's directed at an application, such as commands, search queries, or dictation. The Conversational model is appropriate for recognizing speech that's spoken in a conversational style. This type of speech is typically directed at another person and occurs in call centers or meetings. A new model called "Universal" is also publicly available. Universal aims to tackle all scenarios and eventually replace the Search and Dictation and the Conversational models. As shown in the following example, after you've specified the base language model, use the Language Data drop-down menu to select the language data set that you want to use for the customization. As with the acoustic model creation, you can optionally choose to do offline testing of your new model when the processing is complete. Model evaluations require an acoustic data set. To do offline testing of your language model, select the check box next to Offline Testing. Then select an acoustic model from the drop-down menu. If you haven't created any custom acoustic models, the Microsoft base acoustic models will be the only model in the menu. If you've picked a conversational LM base model, you need to use a conversational AM here. If you use a search and dictate LM model, you have to select a search and dictate AM model. Finally, select the acoustic data set you want to use to do the evaluation. When you're ready to start processing, select Create. Next you'll see the table of language models. There will be a new entry in the table corresponding to this model. The status reflects the model’s state and will go through several states including Waiting, Processing, and Complete. When the model has reached the Complete state, it can be deployed to an endpoint. Selecting View Result shows the results of offline testing, if you performed it. If you want to change the Name or Description of the model at some point, you can use the Edit link in the appropriate row of the language models table.